THE new patented two-dimensional cutter, Urschel Model M6, is a versatile machine designed for dicing, strip cutting, or shredding a variety of products through a wide range of sizes from product of a predetermined thickness. According to Heat and Control , it is ideally suited for cutting frozen-tempered, fresh-chilled, or hot cooked beef, pork, or poultry in addition to leafy vegetable products. The Model M6 operates continuously at high production capacities. Product is delivered onto a high speed feed belt. This belt carries the product to the dicing unit. Product is pinched between a feed roll and the drive roll at the end of the feed belt. The feed roll, which is spring loaded and adjustable, allows product of varying thicknesses to move through the dicing unit without being crushed. 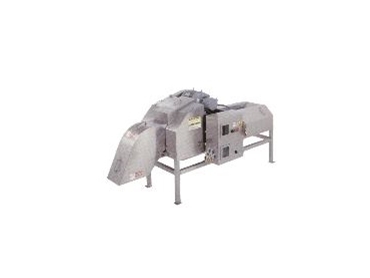 Product is forced into circular knives which run in narrow grooves in the rotating feed drum. The resulting strips are then removed from the circular knives by a stripper plate which also acts as a shear edge for the crosscut knives. The strips of product move directly into the rotating crosscut knives producing cubes or rectangular pieces of predetermined size. Due to application differences in product temperature and texture of specific products, a no-cost product test in Heat and Control’s Product Testing Facility is strongly recommended.